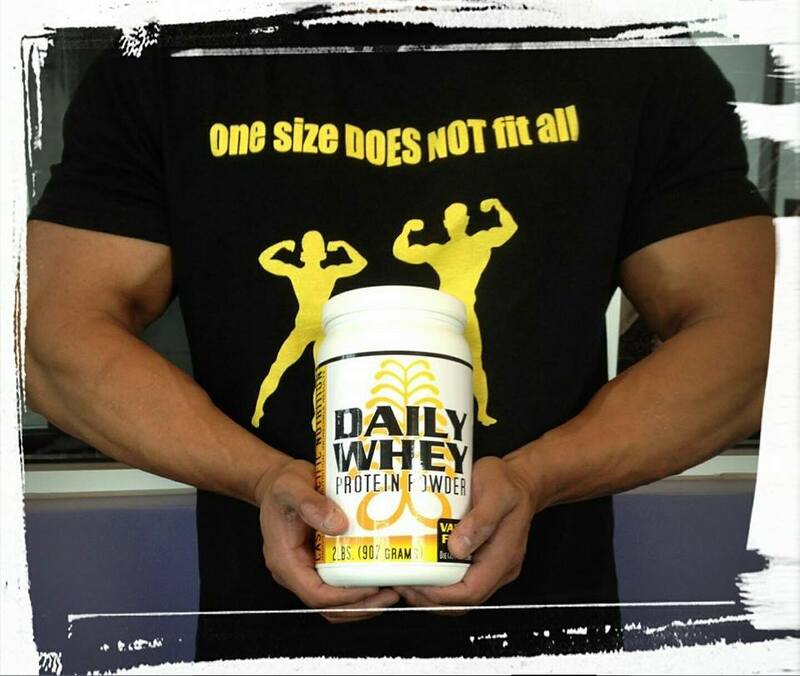 Have you had your Daily Whey today? Click your preferred flavor to buy now on Amazon! Subscribe now to receive your FREE ‘DailyWhey’ recipe list! A majority of Americans already get enough protein in their diets without adding a protein shake. 15% of total calories are generally recommended to be from protein, in order to maintain basic building recovery in the body. In recent years, diets have been tested with protein attributing up to 35% of total calories. These diets have proven beneficial for many different populations. As mentioned before, many Americans over consume protein, which if done to an extreme extent, can have a tolling effect on the kidneys. As a rule for the general population, it is completely unnecessary to consume more than 1.0g/lb protein per day. Even this value is considered high for the general population, and has more relevance to the bodybuilding and fitness community. An easy reference for protein needs in active people is 0.8g/pound of bodyweight. For a more ‘Case Specific’ analysis, consult with a Registered Dietitian! SHOULD I TAKE A PROTEIN POWDER? Protein powders are a very versatile complement to the diet. I personally use it as an on the go protein source to mix with real foods, to recover from my workouts, to manage my macronutrients based on my activity level throughout the day, and to help the occasional sweet tooth. Protein is the nutrient that helps satiate, especially when paired with fiber. When a meat and vegetable meal isn’t within reach, a protein powder can help keep you satisfied without taking in an excessive amount of calories. It is also fun to bake with, and when used well can balance the macronutrients of your favorite sweet treats! Management of calories is one of the best benefits protein can offer any individual trying to lose weight. Contrary to the snacks and meal options common in our diet, carbohydrates are only necessary in the body in high amounts when an individual is being physically active. When sedentary, the body does not need very many carbohydrates to function. In fact the only part of the body that prefers a steady stream of sugar (from carbohydrate) at all times is the brain. Once the body becomes active, carbohydrates become the body’s most effective fuel source. How does protein help? If you are like many Americans who have a sedentary job and workout in the early mornings or late evenings, it is very beneficial to learn to feed your body what it needs. Focus carbohydrate intake around the workout, and eat protein and fat based snacks with vegetables during the sedentary part of your day. What you will find is instead of having a diet that is a majority carbohydrate, your macronutrient ranges will become more balanced. As mentioned early, consuming 35% of total calories from protein is not considered harmful, and can be beneficial. Ideally, the diet would contain 25-35% of calories from protein, 25-30% of calories from fat, and the remaining 40-50% of calories form carbohydrates. These values are not accurate for everyone. Runners, cyclists, and other athletes often need more carbohydrates based on activity. If you are unsure of you macronutrient needs, a Dietitian can help you find the right balance! Whey Protein: Water soluble milk derived protein. Whey is a complete protein, meaning it contains all nine of the essential amino acids. Whey is the most common powder used among athletes and health enthusiasts. Whey is very easily digestible, very highly absorbed in the body, and has a generally agreeable taste. There are multiple types of whey which all carry advantages and some disadvantages. The least broken down of the whey powders. Generally is approximately 70% protein. The body can digest and absorb within 2 hours. Watch levels of cholesterol. Shorter peptide chains are separated into this blend. Generally this product is around 88% protein. Many isolates claim the body can digest and absorb in 60-90 minutes. Since you likely consume a Whey Powder with carbs and/or fats, the hypothesized increase in rate of digestion becomes null. Generally isolate products have less than 1g carbohydrate per scoop, and are low in fat and cholesterol. Isolates can be quite expensive. For the general population it is very unnecessary to drink a broken down protein, since your stomach does that for you. The real benefit of incorporating a whey isolate in a blend is to remove the cholesterol, lactose and mineral deposits that come with a concentrate (hence why daily whey has no cholesterol! ), while maintaining the taste and texture of a whey concentrate. I recommend most people use a protein powder to round out the macronutrient distribution of meals or as a pre or post workout supplement. This protein type consists of peptide chains that are broken down using an acid or enzymatic reaction. This process mimics what the stomach does when it secretes hydrochloric acid to activate enzymes that break down protein. Hydrolyzed whey can often have claims touting their absorption within 1 hour of consumption. These products are generally up to 98% protein, and have little to no carbohydrate, fat or cholesterol. Aside from the high price, the biggest disadvantage is the process of hydrolysis. Exposing peptides to acids and enzymatic break down causes some of the structures to be damaged and thus less functional. This is inevitable when protein is consumed and digested in the stomach, but when the product is pre-hydrolyzed, that exposes the peptides to acidic and enzymatic reactions twice, which increases the likelihood of damaged protein. It also carries the same disadvantages as the isolate when considering what the product is consumed with. Common Name egg protein. Takes longer to fully break down (approximately 6 hours). Has a great amino acid profile and is a wonderful protein source in the morning or evening. Generally, has less of an allergen risk (depending on production facility). For those with allergen concerns (Milk, Soy etc. ), Albumin is a great option. The powder tends to be very highly priced and unless you are purchasing for convenience, to curb a sweet tooth, or to add to certain foods (oatmeal), I would recommend just using actual egg whites! Complete protein that meets criteria for vegan diet. Has a characteristic after taste that some find unpleasant. Does not dissolve as well when mixed with fluids, so powder may produce a clumpy or textured drink. Studies on absorption suggest it is a highly absorbed source of protein with a complete amino acid profile. There are many of these, but two of the more common are pea and hemp protein. The bioavailability of these proteins is very poor compared to the types listed above. That being said, if a vegan is having trouble meeting their macronutrient goals with just food, there could be some benefit in using them to complement the diet. Instantized: Processed and mixed with soy lecithin. Gives product a smoother texture and increases the “mixability” of the product. Protein is the foundation for life itself. The body relies on protein to build and maintain itself. Protein is present in every part of the body. Protein helps repair old cells, create new cells, and is vital for growth and development. When proteins are digested in the stomach and small intestine, the resulting amino acids are absorbed. The human body needs a many different amino acids for optimal health. Amino acids are found in animal sources such as meats, milk, fish, and eggs, as well as in plant sources such as soy, beans, legumes, nut butters, and some grains (such as wheat germ).